You think your PC is fast? Getting meaningful results from a quantum computer requires what can only be described as a little magic. Traditional computers – from your desktop PC to the supercomputers that IBM builds when it's showing off – all use a system of switches that can be either on or off. We represent this binary state with a 1 or a 0. Quantum computers are different in that they can be in both of these states at the same time. These states are called 'superpositions'. The basic unit of a quantum computer is a quantum bit or 'qubit', and their ability to be in two simultaneous states is what makes quantum computers so fast. Sound more like magic than science? Read on, and you'll discover that despite all the arcane physics, a working practical quantum computer could be just around the corner. Interest in quantum theory and its application to computation is partly a result of work carried out by the mathematician Peter Shor. He developed an algorithm that could factor large numbers using a quantum computer. The possible speed of this algorithm shows the potential of the technology. Shor's algorithm is so powerful that it holds the promise of cracking the supposedly watertight encryption you and I use when doing internet banking, something that no conventional computer has come close to. Indeed, the potential processing power of quantum computers truly boggles the mind. 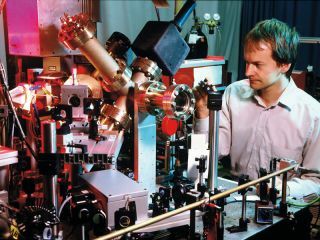 Because a quantum computer essentially operates as a massive parallel processing machine, it can work on millions of calculations simultaneously (whereas a traditional computer works on one calculation at a time, in sequence). A 30-qubit quantum computer would have around the same processing power as a conventional computer processing commands at 10 teraflops per second. By way of contrast, current desktop computers operate at mere gigaflops-per-second speeds. This sounds great, so why aren't we all using them? The answer is that, at present, a working quantum computer capable of solving real-world problems is still firmly on the drawing board. To see why producing a proper machine is so hard, we need to go back to basics. Electrons, photons and atoms form the memory and processor of the quantum computer. These comprise the magical qubits. Understanding, building and manipulating these qubits is the really tricky part of getting a quantum computer to function. It could even be said that the quantum computer exists in a parallel universe to our own. When the computer works on a problem that you've given it, the calculations are performed within this parallel universe until an answer is presented. But it doesn't stop there. You can't just see the answer when the calculation is complete. In fact, you can't see the answer at all until you actually go looking for it. And when you do look for it, you could disturb the state the quantum computer is in and end up getting a corrupted result. All the parallel calculations that the quantum computer is doing don't actually collapse down to a final answer until you consciously try to observe it. In some ways, then, it's not the answer itself that's important, but how you get hold of it. It's this observational component of the quantum computer that forms the biggest obstacle to actually building one. Physicists refer to this problem as 'entanglement', what Einstein called "spooky action at a distance". Entanglement is, in essence, the result of observing how one qubit behaves based on the state of another qubit. What causes headaches is that as soon as you look at one qubit, you change its state and the entire system collapses back into being a standard digital computer. This is known as 'decoherence', and is what makes the observations or results you're looking at inaccurate or misleading. For these complex reasons and many others, actually building a working quantum computer that can solve real-world problems is far from easy.